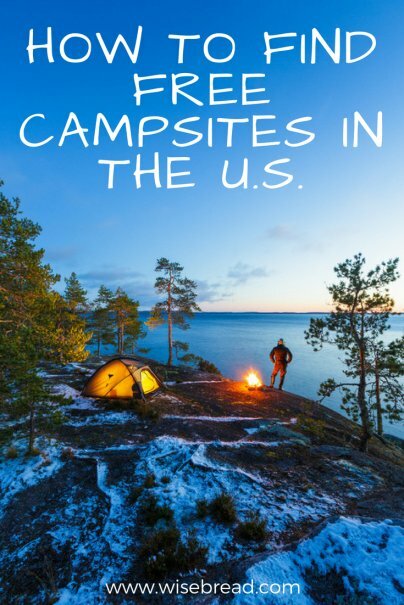 Home » Frugal Living » Budgeting » How to Find Free Campsites in the U.S. Camping is generally considered one of the cheapest ways to vacation, but many private campsites these days charge pretty hefty fees. The price of setting up tent in an established campsite can add up quickly and turn a budget getaway into a bank breaker. Modern campsites can also feel a little too rigid — laid out like parking lots with minimal space between tents and crammed with fancy RVs. Having fantastic amenities like bathrooms, picnic areas, electricity hookups, and even Wi-Fi is great for some, but for other people it can almost negate the simple pleasures of escaping into the wilderness. Dispersed camping means wild camping, so you'll need to be willing to forgo all the amenities and facilities you'd find at a typical campsite. No bathrooms, no electricity, no running water, and no picnic tables. You will literally pick a spot in the great outdoors where you can pitch your tent without charge. Many dispersed camping sites are in extremely remote locations, so don't count on being able to a get phone signal or mobile internet access. Because of this, you should always plan ahead by downloading a map of the area, or even carrying a paper one. The vast majority of Bureau of Land Management land is located in the western part of the U.S., with just a few spots throughout the rest of the country. Though you'll find plenty of developed campgrounds on BLM land, you can also do dispersed camping in many undeveloped locations. Ordinarily you can camp in these areas for up to 14 days, although this does vary from site to site, and in some places you'll need to secure a permit beforehand. There are over 150 National Forests across the country, and are managed by the U.S. Forest Service. The U.S. Forest Service helps preserve and protect these stunning wooded areas and the wildlife that lives within them. You are generally permitted to camp on National Forest land as long as it doesn't specify that you shouldn't, and there is usually a 14-day limit. National Wilderness areas are dedicated regions of pristine landscapes that have been undamaged by human developments. While they are managed by the National Park Service, the U.S. Forest Service, the U.S. Fish and Wildlife Service, and the Bureau of Land Management, they are different in that they are not allowed to be developed in any way, to preserve the beauty and untouched nature of the wilderness areas. With over 750 designated National Wilderness areas covering over 109,000,000 acres of land, there are plenty of opportunities to camp. You can search on the Wilderness Connect website by name, state, on a clickable map, or by attribute. For more detailed maps, you'll need to contact the agency that manages it directly, and any questions about camping regulations for these sites should be directed at them as well. The most comprehensive listing of free camping sites can be found on the website of the same name, Free Campsites. It has an easy-to-use interface that enables you to search by location, and focuses on public land like the areas listed above. It's user-generated data, so it's continuously growing as people discover more great camping spots. And if you find an awesome place to camp, you'll be able to add it to the database as well. You can also filter them according to amenities, the kind of access they have, and the activities you can do in or around them. Park rangers are also a great source of information on free camping sites, so if you're visiting a National Park and come across one, ask them to share a bit of insider knowledge. They are fellow lovers of the outdoors, and will be able to give you off-the-beaten-path destinations and hidden locations that may not be published anywhere else.